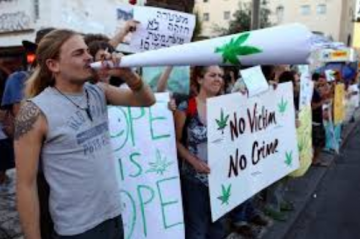 Tel Aviv: With the recent ruling decriminalizing cannabis in the State of Israel, Tel Aviv residents are concerned that they may start smelling marijuana smoke on the streets. Like, In Tel Aviv. Marijuana smoke. We mean, out in the open and stuff. The Daily Freier set out to get all the facts before we started to make things up. North Tel Aviv resident Yoni K. also shared his fears. “Next thing you know, people will be smoking spliffs at a Tuesday night rooftop party, one of those bars on Dizengoff with the long tables and benches, or at a bus stop in broad daylight on Ibn Gvirol.” (Note to the satirically impaired: This is already happening). This week’s ruling has had ramifications beyond Israel’s borders as well, with 2016 United States Libertarian Party Presidential Candidate Gary Johnson indicated that he may be now interested in a fact-finding visit to the Holy Land. Quiz: Is it a Peter Beinart Op-Ed or Taylor Swift Breakup Song?